At ProductiveMuslimah, we believe the ultimate secret to a successful Muslimah is that she strives with sincere intentions and uses all the resources around her to achieve the highest stations in Paradise. We are always looking for the ‘secrets to productivity’ and wanted to explore how some of the Muslim women today manage time effectively and perform the best in all the roles they hold being a mother, wife, daughter, professional, activist and more! Ramadan is an especially important time for sisters to reflect and gain as much reward and forgiveness as possible from Allah . So we decided to get some of the ‘Productive Muslimahs’ of our time in the hot seat to find out their top tips and secrets to become a Productive Muslimah! We are very excited to be joined in this special Ramadan edition by Sister Zohra Sarwari, an international author of ten groundbreaking books, coach to women and children, business coach, entrepreneur, public speaker, mother of 3, and founder of SuperCharge Homeschooling! She is in our ProductiveMuslimah hot seat today, so we asked her to tell us her secrets on how she manages to stay productive during Ramadan while juggling her family, her work and her writing! Bismillah, wal Hamdullilah. Jazak Allaah Khairan for having me here and for thinking of me as a Productive Muslimah. Alhamdullilah, my inspiration is my Lord. I love Him so much, and am thankful for guidance and everything else He has given me. 2) Masha Allah you currently home-school your children and have set up a fantastic website, full of resources to help parents with homeschooling (SuperCharge Homeschooling). What was the deciding factor that led you to homeschooling your children? What benefits have you seen that could not be achieved with regular schooling? The deciding factor for me was when I learned what would benefit me after I die. Since my children would be one of those cases, I needed to invest in them so that they may benefit me when I need it most insha’Allaah. Benefits I have seen are alhamdullilah many. Better tarbiyah, praying 5 times a day, fasting the month of Ramadan and other days, learning the Qur’aan, and wanting to memorize it in sha Allah. Also graduating from secular studies early in sha Allah. 3) What advice would you give to mothers who find the idea of homeschooling daunting? Is it accessible to all? 4) Alhamdulilah, the blessed month of Ramadan is upon us. How do you manage teaching your children during this busy time? During this beautiful month we cutback on the dunya studies, and focus more on fasting, reading the Qur’an with meaning (tafsir), and learning something new for our deen. In sha Allah this year’s goal is to memorize Allah’s names and attributes; while we have done some of them in the past, this year I really want us to know it inside out in sha Allah. Again, all with the help of Allah . 5) For mothers, Ramadan tends to be a month spent living in the kitchen, and when they’re not there then they’re engaged with some other household responsibilities. How can they make time for themselves to be spiritually productive and to feel that they have made the most of productivity during Ramadan? First of all, the concept of us cooking all day must be deleted especially in this month. We need to make a schedule and write down what we are cooking which days, how long each meal should take, and if we are eating leftovers the next day. We should really try to make it where our meal or meals do not take more than 1 hour each day. I personally like cooking extra and eating leftovers. As much as I love my family and friends, I do not like to attend iftar parties, as it will take away from my ibadah time. This month we have no time to waste, and Allah knows best. Also while cooking they [sisters] could listen to the Qur’an or a lecture so that they may be rewarded that way as well in sha Allah. 6) It is important of course, to get the whole family involved in activities during Ramadan. How can mothers work with children to instill an understanding and spirit of Ramadan within them? 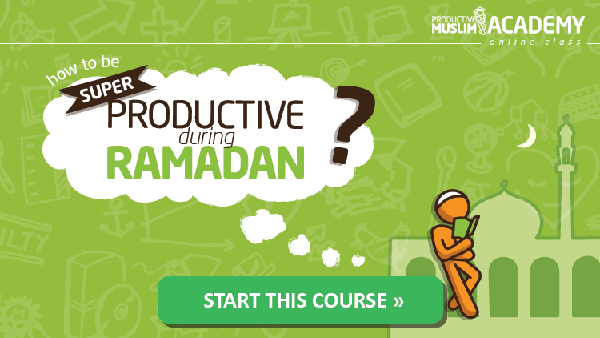 By making a schedule of exactly what they are doing each day, and what their goals for Ramadan are. Ramadan should be fun for kids, and they should get rewarded for even the small deeds that they do. 7) What is your role as a wife within your family during Ramadan, and how has this helped your family’s overall productivity? My role is to make sure I wake up early and cook and get food ready for everyone, to inspire them through out the day, reward them here and there, and share our schedule daily so that we are all on the same page. This way they see the goals we have and they want to achieve it as well in sha Allah. 8) Jazakillah khayr for all of your advice Sister Zohra. Can you give us any last words of advice to mothers so they can enjoy a productive Ramadan? Any advice, tips, something that worked with you, anything behind the scenes, something you tried last Ramadan that worked wonders? I would say make your intention to make each Ramadan as if it is your last one. Think of each day as one you may not be here for next year. Plan accordingly, be happy, and be SUPER patient as shaytaan is locked up! Make a schedule and stick with it. Ask your kids to share any knowledge that they obtain during dinner time. Make Ramadan about fasting, not about eating. How you behave and act is what your kids will learn in sha Allah! Jazak Allah Khairan! Well thank you to Sister Zohra for the wonderful advice and practical tips – there you have it sisters! Let us know your thoughts and comment below, and don’t forget to look out for our next instalment of ‘Secrets of a Productive Muslimah’!